Caught in our own sand castles. 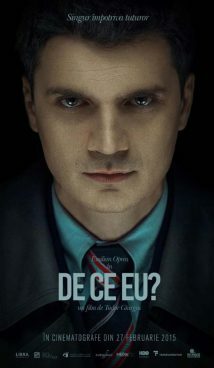 Based on real events, „Why me?” directed by Tudor Giurgiu tells the story of Cristian (played by Emilian Oprea), a young idealistic prosecutor whose career is on the rise and tries to crack a corruption case placed in the complicated socio-political context of Romania in the 2000s. On April 10th 2002, Romanian prosecutor Cristian Panait committed suicide by throwing himself from the 4th floor of his residence in Bucharest. He was only 29. A year before, he had been appointed prosecutor at the Department of Criminal Investigation and Criminal Prosecution of the Supreme Court of Justice. One particular case he was working on at the time was that of prosecutor Alexandru Lele, from Oradea city, who had ordered the arrest of Adrian Tărău, son of the very influent Bihor county prefect, on charges of complicity in the smuggling of petroleum products. Panait’s mission was to investigate prosecutor Lele for corruption and document theft allegations. According to media reports, Panait refused to charge Lele due to lack of evidence, but in less than a month he took his own life. In August 2002, the case was closed after a “post-mortem psychiatric evaluation” allegedly proved the prosecutor to have been mentally unstable. No other hypothesis, such as “facilitating” or “determining” the suicide, was ever pursued.